Drakenstein Stud’s Cartier Champion Duke Of Marmalade enjoyed a memorable weekend this week, with the son of Danehill not only responsible for another European group winner but also featuring as a half-brother to two impressive performers overseas. Duke Of Marmalade ‘s talented three-year-old daughter Flower Party picked up the first group win of her career when she won the G3 Premio Verziere Memorial Aldo Cirla at San Siro on Saturday. Despatched the 8-11 favourite for the one mile two furlong contest, Flower Party tracked the leaders early on before hitting the front with two furlongs left to go. Flower Party, one of 37 stakes winners thus far for Duke Of Marmalade, had previously won the Listed Premio Archidamia by ten lengths, and also finished second in the G2 Oaks d’Italia (Italian Oaks) earlier in the year. Her five time G1 winning sire Duke Of Marmalade is a half-brother to exciting two-year-old Norway, who showed his class when winning the Listed Godolphin Flying Zetland Stakes at Newmarket on Saturday. Trained (like Duke Of Marmalade), by Aidan O’Brien, 2yo Norway was produced down the centre of the track by Seamie Heffernan to hit the front inside the final furlong and beat I’ll Have Another (12/1) by a length. The winning trainer said: “He’s a very well bred horse, he’s a full brother to Derby winner Ruler Of The World, and he’s going to be a lovely middle distance horse for next season. 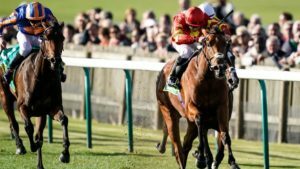 Norway was given a 25-1 quote for the 2019 Investec Derby following Saturday’s win. 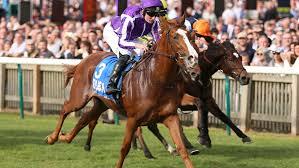 Yet another half-brother to Duke Of Marmalade and full-brother to Norway, the 2013 G1 Investec Derby hero Ruler Of The World, made headlines when his daughter Iridessa captured Friday’s G1 bet365 Fillies’ Mile at Newmarket. A first G1 winner (from his first crop) for Ruler Of The World, Iridessa powered clear to beat favourite, and G3 Weld Park Stakes winner Hermosa by a length and a half, with G1 Prix Morny heroine Pretty Pollyanna three parts of a length away in third. Now a winner of two of four outings, Iridessa now appears a likely hope for the 2019 classics. (She was quoted a 16-1 chance after Friday’s race for the 2019 Investec Oaks). Ruler Of The World, Norway and Duke Of Marmalade were all produced by the Kingmambo G3 Killavullan Stakes third Love Me True -a three parts sister to US champion and top class sire and broodmare sire Lemon Drop Kid. Duke Of Marmalade, whose daughters Santa Clara and Temple Grafin both hold entries for the G2 Western Cape Fillies Championship, has two lots on offer at the 2018 Emperors Palace Ready To Run Sale and four lots on the CTS Ready To Run Sale, with both auctions set to take place in November.